Forms, Forms, all types of Forms! Want your invoices, forms and receipts to look more professional and branded? Then let us design your custom form to get exactly the look you want and the fields you needs. Don’t settle for generic forms, get exactly what you need! 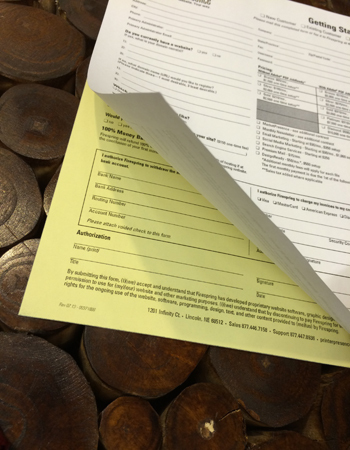 Invoices, work orders, contracts, service agreements, are all items you can benefit from carbonless copy forms. They can be numbered, padded (have a glued edge) and can be collated in any order with many color paper choices. Yes, people still have a need for continuous forms. They are not as common but we still offer support for companies that use these with many options. 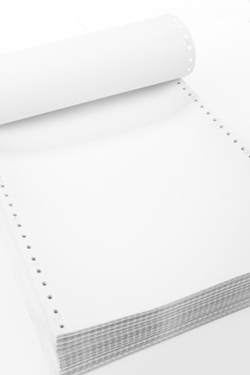 The carbonless paper process was invented in 1952 by chemists Lowell Schleicher and Barry Green, working for the NCR Corporation, as a biodegradable, stain-free alternative to carbon paper. Early product literature called the paper No Carbon Required paper, the well-known initials of the developer, National Cash Register company. Carbonless copy paper consists of sheets of paper that are coated with micro-encapsulated dye, ink or reactive clay. The back of the first sheet is coated with micro-encapsulated dye. The lowermost sheet is coated on the top surface with a clay that quickly reacts with the dye to form a permanent mark. Any intermediate sheets are coated with clay on top and dye on the bottom. Applying pressure from writing causes the micro-capsules to break and spill their dye. Since the capsules are so small, the print obtained is very accurate.